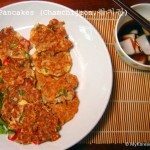 Super easy Korean tuna pancakes! 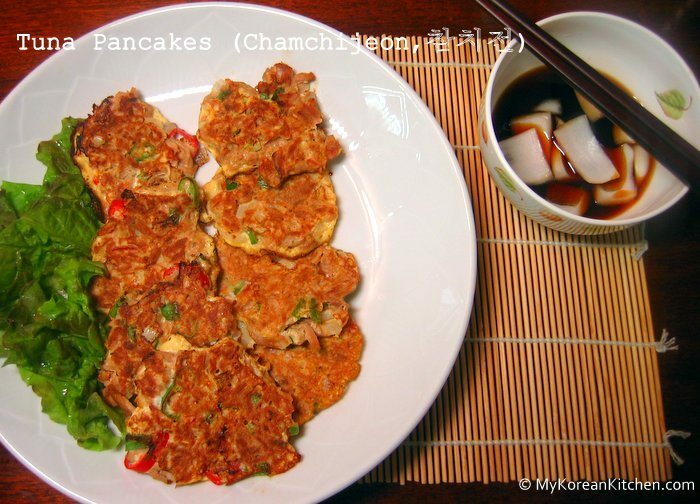 Tuna pancakes (Chamchijeon, 참치전) is something you can make easily with readily available ingredients from your pantry. It’s a great side dish for kids (without chili to remove the spiciness) and it will go well in anyone’s lunchbox. I hope you get to try this soon! 1. Combine all prepared ingredients into a mixing bowl. Mix them well. 2. Pre heat a frying pan and add some cooking oil. 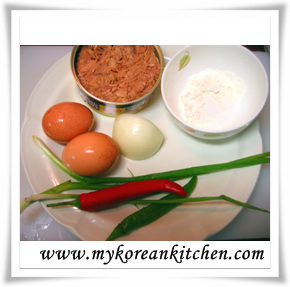 Scoop out the tuna and vegetable mixture with a spoon, and put it onto the pan (each spoonful makes one pancake). 3. Turn it over when the bottom side cooks. Remove from the pan as both sides of pancake cooks. Repeat the step 2 and 3 with the remaining ingredients. Combine all prepared ingredients into a mixing bowl. Mix them well. Pre heat a frying pan and add some cooking oil. 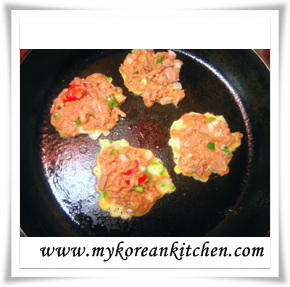 Scoop out the tuna and vegetable mixture with a spoon, and put it onto the pan (each spoonful makes one pancake). Turn it over when the bottom side cooks. Remove from the pan as both sides of pancake cooks. Repeat the step 2 and 3 with the remaining ingredients. what’s the nutrition break down of your dish? 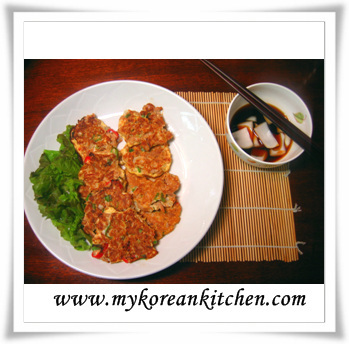 Hi, good recipes on the site, thank you. I was wondering though, I if you meant table spoon and not teaspoon? “tsp” means teaspoon, and table spoon is abbreviated as T., tb., tblspn, tbs. or tbsp. It didn’t seem like “batter” for a pancake, but maybe I did something incorrectly or maybe the eggs make up for the lack of batter-ness. Yes, all of my attempts at making pancakes have been quite unsuccessful. Apparently I’ve been missing the flour. Thank you so much for a great recipe! Great work! 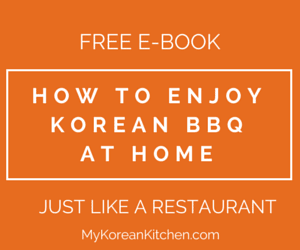 I am very glad to hear your successful Korean cooking stories. 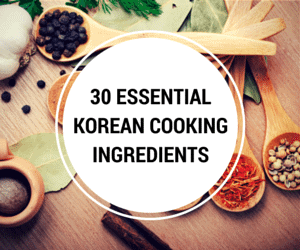 I came across your website yesterday whilst researching Gochujang (I’m trying to learn about Korean food) and tried out the Bibim Guksu as I had all the ingredients in the cupboard. We loved it! I’ve tried to find alternative ways to serve Soba noodles without Japanese dashi so I could serve it to Vegetarian friends but they never tasted nice – the Bibim Guksu was delicious! Bolstered by the success of this recipe I made the tuna pancakes later that same evening (which are incredibly easy). On their own with a little hot sauce they are very good, but with the dipping sauce they are fantastic. So for lunch today we had Kimchi Bokkumbap, stir fried Gochujang with minced and marinaded Quorn (a meat substitute) and more of the Chamchijeon – because they were so very good the last time. 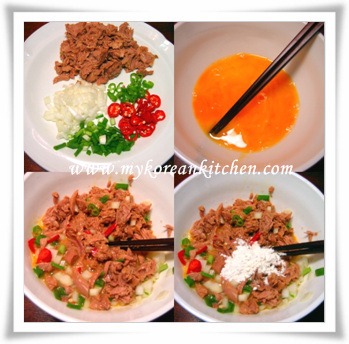 Again – everything was easy to prepare and tasted fantastic. 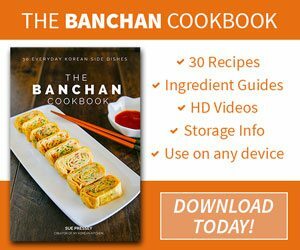 Thank you so much for posting your easy to follow recipes. Korean food has always seemed intimidating for me but your blog is easing me in gently and successfully. We feel so good after our meal right now – like we’ve just got out of a very hot bath! I’m looking forward to trying more. I used all purpose white flour for this. Good luck with your pancakes. All my attempts at pancakes so far have been disastrous, I will try your recipe to see if I have any luck this time! I just wanted to check whay kind of flour you use, is it rice flour or white wheat flour?